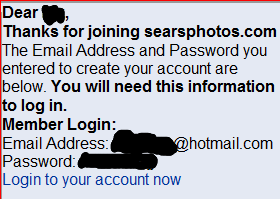 Got this e-mail from searsphoto.com. Note that they included full login info (name AND password) in the e-mail…SENT IN CLEAR TEXT ACROSS THE INTERNET!!! What are they thinking????? ?